The first and most frequent question I get after my elevator pitch is this: What exactly is experiential marketing? Fair play, my fellow professional. With ever-evolving technology providing new means of connecting with consumers, even industry insiders sometimes struggle to describe the exact scope of the practice. At Montage, we define it simply: Experience marketing is a mutually beneficial interaction between a customer and brand in an authentically branded engagement. Be it through a headset or on a swing set, experiential is and always has been about creating meaningful connections between brands and customers. Can you give me some examples of experiential marketing? Of course! There are three core categories of experiential. What’s best for a brand depends on what we call The Dimensions of Experience. The Dimensions of Experience are based on the desired outcomes (impressions, sales, customer satisfaction) – and the environment of the engagement (a festival, conference, daily commute). They impact what a brand competes with for the consumers attention and the audiences’ mindset as they engage. Quick hitting engagements capture the attention of a high volume of people for a short time. Promotional brand experiences closely resemble traditional event marketing. Venues tend to be fairs, festivals or existing events. Attendees vary widely across demographics and psychographics. Engagements are often short in length to accommodate heavy traffic volume. Tactical brand experiences employ a stand-alone engagement as the totality of the campaign. Sweepstakes, digital games, contests and guerrilla efforts are all tactical experiences. The return on investment can be highly variable, but when done well, tactical experiences can become trending topics. Multiple brands share space and the limelight in these engagements. Co-promoted brand experiences occur among partners that are associated in some way. Brands must share the spotlight in co-promoted experiences, but benefit from the built-in audience and the resources of each other. By association, the equity of one brand is haloed by the other. Sponsorship of a venue, event or public figure(s) is also a type of brand experience. Sponsored experiences are typically longer in length to ensure audiences attribute the values of sponsor to the sponsored entity. Brands borrow equity through sponsorship benefits such as naming, exclusivity and placement. The brand sits at the core of proprietary engagements, but the relationship to the customer varies by type. Integrated experiences occur within a larger experience that’s not about the brand. Venues tend concerts, auto or trade shows where a specific interest, category or activity is the motivating driver for participation. Engagement is a part of the larger environment, and the brand is competing for attention with other like-minded brands. Stand-alone experiences happen on their own, rather than part of a greater event. Audiences tend to be smaller, but not necessarily more targeted. The duration of a stand-alone experience is often longer to optimize traffic availability and flow. Cross channel experiences exist as part of a broader integrated marketing campaign. The engagement either leads or supports the overall campaign and helps bring to life existing advertising efforts. The experience is also designed to provide a platform for PR activation as well as digital and social content creation. Foundational experiences support a platform that lives on for longer than the promotional timeframe. They build off previous activities that maintain the connection to the audience. Foundational experiences are often attended by repeat customers or supporters, and help to establish longer-term relationships with audience members. One-of-a-kind experiences boast the claim of having never been done before. They are often highly tailored to their audience and costly. Their wow-factor and exclusive positioning create high expectations and shareability among audience members. To understand experiential is to understand the breadth and depths of brand experiences. 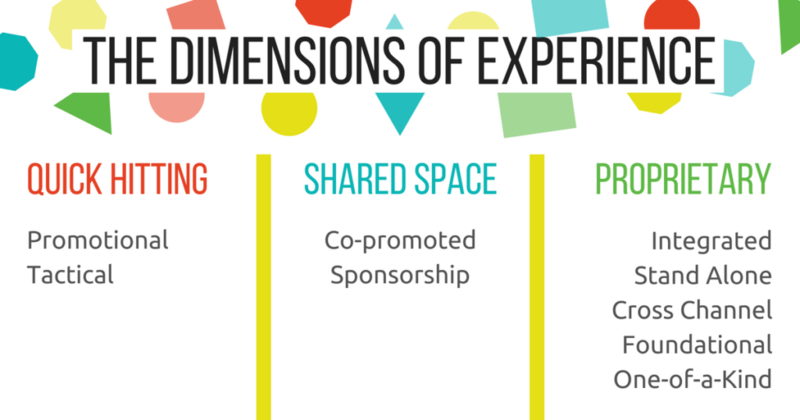 Use the Dimensions of Experience as a guide to determine what type of experiential is right for your next engagement. Explore our work to see the Dimensions of Experience in action and test your knowledge with our 10-question Types of Experiential Quiz.